The Grand Calumet River has long been recognized as one of the most contaminated rivers in the nation. 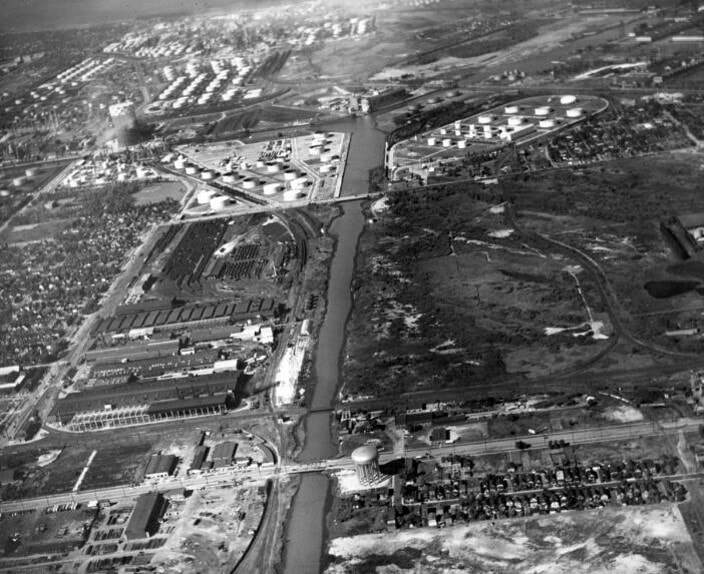 With a history rich in steelmaking, meatpacking, and oil refining, a cocktail of heavy metals, PCBs, PAHs, NAPL, and oil and grease was discharged into the river before modern environmental controls were established. Water quality is still challenged by pollution from combined sewer overflows, non-point sources, and industrial discharges, but the sources responsible for sediment contamination are mostly a thing of the past. And concerted efforts to clean up the river are making it closer than ever to becoming safe for people, fish, and wildlife to use and enjoy. ​Since 2009, more than 2 million cubic yards of contaminated sediment have been dredged or capped in the 13-mile Grand Calumet River system under the Great Lakes Legacy Act (GLLA). Acres of wetland have been restored with native trees, grasses, and other plants, providing food and shelter to local fish and wildlife. ​The Lake George Branch Middle & East section of the Grand Calumet River has completed the design stage, and is ready for cleanup. The Grand Calumet River has been a hub for Great Lakes commerce for over a century. Lake George Branch Middle & East is in the Grand Calumet River Area of Concern, whose entire system flows through the northwest Indiana towns of Hammond, East Chicago, and Gary.